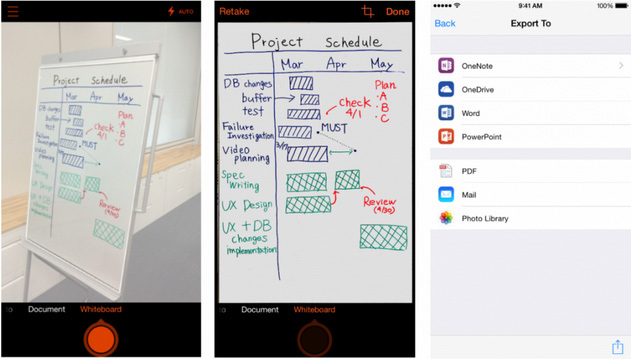 Microsoft’s focus on iOS and Android continues with the release of Office Lens. It’s a portable scanner that allows you to take pictures of documents, receipts, business cards, and whiteboards to save and edit them digitally. Yes, there are other apps like this already, but Microsoft’s unique offering is its excellent Office integration. Office Lens was originally a Windows Phone app, and an impressive one at that. As the demo video shows, you simply take photos and the app does the rest. For example, take a picture of a document and the app will preserve the layout and convert the text with OCR. Another great usage: take photos of a whiteboard and Powerpoint will convert hand-drawn whiteboard images into objects that you can move, resize, and edit. It even recognizes receipts, menus, sticky notes, and more. Its ability to automatically crop and enhance images is notable. You can save photos directly to OneNote or OneDrive as a JPG image, Word document, Powerpoint presentation, or a PDF. You can also share it to social media if you want. Office Lens is available for iOS starting today. There’s an Android version, too, but that’s in preview mode. You’ll need to go through some hoops to get to it, but I think it’s worth it. This app shows off a new Microsoft, one that is focused on mobile first. Microsoft has recently been dominating with its mobile offerings, so this app comes as no surprise. Let’s see how else they keep the ball rolling.